The “Peony System” refers to our line of expandable plastic foam molding machines. 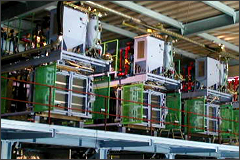 There are several molding machines available. Additionally we produce several machines to support factory automation such as Packaging machines, and Labelers. Our engineering team can also support and manage projects for the construction of any foam manufacturing plant.